The first version of our family farm began in the backyard of a cozy North Berkeley neighborhood where three friends collaborated and developed an efficient urban salad farm. Borrowing from the French Intensive practices, the observations of Rudolph Steiner and the collective wisdom of our community we managed to produce pounds and pounds of the gorgeous salad greens known in Provence as Mesclun. This slang word simply means mix and it describes a blend of small, young leaves of arugula, lettuces, dandelion, frisée, chervil, with extras like tiny nasturtium leaves, flowering herbs or whatever the garden happened to be offering on any given day. It was always a little different and it was always very beautiful and delicious. It was 1980 and the love of good food and community became the canvas for a food revolution. Authenticity, respect for the old ways and a passion for learning combined with a willingness to work hard and stay focused ignited a million ideas about eating seasonally, producing food sustainably and eating simple, minimally processed foods. Alice Waters and her restaurant, Chez Panisse led the charge. Andrea Crawford had the vision to see the possibilities for developing this salad model she had created for Alice Waters. With the help of cookbook author and friend, Isaac Cronin, she sent off a letter to Wolfgang Puck inquiring if he might be interested in a similar version of this salad garden for his restaurant, Spago. He called her when he received the letter and asked “when are you coming?” And in the fall of 1985, Andrea Crawford and her family relocated to Los Angeles where they developed the first urban salad garden and their work found a permanent home. Kenter Canyon Farms gradually evolved from a series of small suburban backyards and urban lots to our current base of operations in Ventura County where we farm on several small ranches, totaling 160 acres along the south side of the Santa Clara River. This is our “home base” where we grow most of our certified organic herbs, lettuces, vegetables and a selection of citrus and avocados. Here we have dedicated five acres of riparian land along the river to a permanent conservation easement that adjoins the Hedrick Ranch Nature Area. This is an important link in the regional conservation efforts under the stewardship of the Friends of the Santa Clara River. We invite you to visit the Friends of the Santa Clara River website to learn more about them and their wonderful work. The biodiversity and wildlife refuge this area provides brings a balancing effect to the areas that are being cultivated. 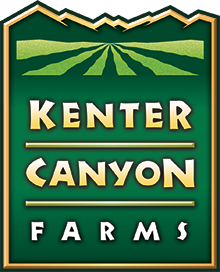 At Kenter Canyon Farms stewardship of our environment is at the heart of everything we do. Preserving wild spaces for the creatures we share the land with is just one piece of that commitment, we also plant rows of flowering annuals between our lettuce rows to offer sustenance for the pollinators that live among us. Our commitment to the stewardship of the land extends to the people around us, we are mindful of the interdependence of our workers wellbeing and the wellbeing of the land. A regional food supply builds strong community. Everything we grow, harvest, pack and ship belongs to the place it came from, to the people who raised it and to the local community that buys it. Through farmers markets, retail partners and wholesale partners who share our values we can offer our herbs and lettuces to the greater Los Angeles area within 24 hours of being picked. Every day we build community that connects us to the people and the people to the land that surrounds them. Food can be something more. That’s what we believe in. That’s what we work for. And that’s what goes into every leaf, every herb and everything we do.